I hope you had a great weekend! We’re technically in our last days of winter, even if Mother Nature has other ideas! Do you have a big Nor’easter headed your way like we do in Philly? It never ends! 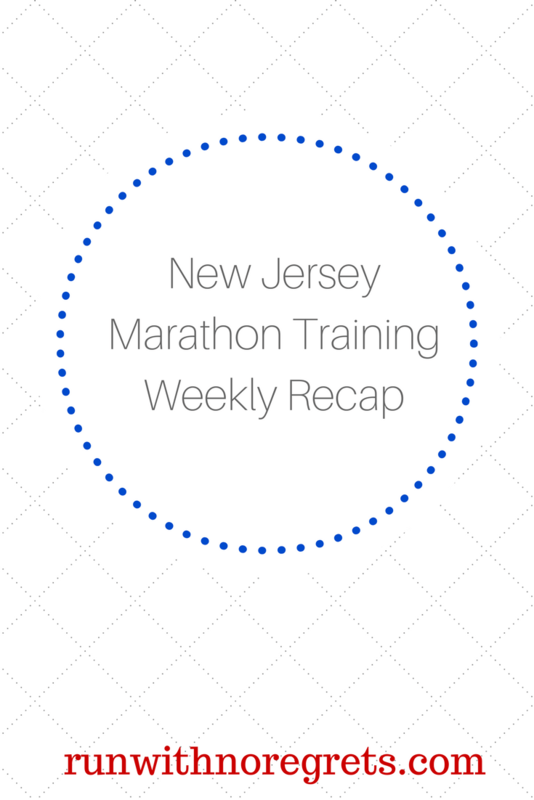 I’m happy to say that I had another solid week of New Jersey Marathon training! I had a lighter mileage this week and I ended up surprising myself. Keep reading to check out my training recap! I’m joining HoHo and Wendy for the Weekly Wrap – it’s always great to see what my fellow running/fitness friends are up to! I’m also joining Courtney for her Weekly Training Recap linkup and Marcia, Patty, and Erika for Tuesdays on the Run! I’ll start with the bad, then end with the good part of the past week! This past week kicked off March Madness, and if you’ve followed me for a while, you know that it’s one of my favorite times of the year and I’ve always got a bracket on the line! I have degrees from the University of Pennsylvania (Penn) and Villanova, and it was very exciting to have them both in the tournament this year! Of course, Penn was given a ridiculous #16 seed and lost to Kansas in the first round. But it was great to see Penn back in the tourney for the first time in 11 years, back when I was still a college student! Well, this year I actually created 2 brackets, thinking I could improve my chances of winning. And I always do my research. But just about everyone’s bracket is busted at this point with more upsets than I’ve ever seen, the biggest being UMBC beating overall #1 Virginia by 20 points! Syracuse beat Michigan State. Florida State beat Xavier. Nevada beat Cincinnati. Texas A&M beat UNC. Marshall beat Wichita State. I guess now I have to watch the games for fun, LOL! Do you participate in March Madness? The good part of the week was wedding planning. Of course, it is still keeping me VERY busy. This past week, I had several conversations/interviews with photographers. I still have a few more to follow up with, but the good news is that I do have a front-runner. Her work is amazing and I thought our personalities clicked during our Facetime chat. My photographer research, like my venue search, has been ridiculously extensive! I really wish that I could learn not to give myself so many choices! The next big decision I’m looking forward to finalizing is the food. This weekend, we went to two tastings offered by prospective caterers. The first tasting was on St. Patrick’s Day at an Open House at a different wedding venue, and they had so many different types of food to try, including brunch! They were very creative and cutesy with some of their ideas. We invited Bret’s mom and my sister to join us for the free food and drink and we had a good time. The blood orange mimosa was fantastic! For the second tasting, it was just Bret and I and it was more of a formal affair. Naturally, we had to try everything they brought out to taste, including some seconds! We were even able to bring some food home in to-go containers. The beef and salmon were amazing! I’m hoping by the end of the month that I’ll have a caterer and photographer locked down…wish me luck! Monday 3/12: Yoga at lunchtime, always a welcome way to start the week! Tuesday 3/13: No tempo run this time, 5 easy miles in the neighborhood. However, since I was in a hurry to make it to a phone call I had with a photographer, the pace was a bit quicker than I anticipated! Wednesday 3/14: Barre and stretch class, taught by Kim. Her class is probably my favorite – she really emphasizes good form and kicks our butts! My hips were really tight in class, which was a bit concerning. But the stretching really helped. Thursday 3/15: 5 easy miles in the neighborhood, with a few sets of strides in the last mile! I haven’t done strides in a really long time so it was fun to mix it up! Friday 3/16: Rest day, minus a few prehab exercises for the knees! My shoulders felt some DOMS from Barre class! Saturday 3/17: Really struggled to get out of bed, so I moved my 3 mile run to Saturday. We kept it nice and easy and enjoyed running through the Wissahickon trail. Thankfully, we didn’t have to dodge any fallen trees this time! Sunday 3/18: 13 miles of amazing! I still can’t believe I was able to run a 9:30 pace for several miles on this run. It was super windy (again) and chilly but I felt really strong on this run, imagine that! I still want to follow up with more KT tape for my knees and foot, but otherwise I never felt better! I’m so proud of what I was able to get done this week. My runs were speedier than usual, so I finally feel like I’m out of my slump! The 13 miler really took me by surprise, though. During that run, I started to really visualize myself at the marathon running strong. I still have no idea what my finish time will look like for the big day, but I’m growing more confident that I will do better than I did for the Philly Marathon! Stretching is becoming more of a habit but I do need to spend more time on the floor with my foam roller. I wasn’t perfect, but overall I think I did great this past week, it was just what my body needed! I have to give week 11 of training an A! This coming weekend will be extremely busy with a Stair Climb and a half marathon (oops – that’s right, I signed up for the Love Run last minute!). So we’ll see how it goes! Did you celebrate St. Patrick’s Day? What are you most looking forward to this spring?